Facebook is rolling out a useful new feature that puts a full weather forecast inside its mobile app and desktop site. The feature is accessible from News Feed or the mobile app’s “More” menu — the section that links you to areas like Friends, Events, Groups, Pages and other key Facebook features like On This Day or Saved items. Within the Weather section, you can view a full forecast for your week ahead, powered by data from Weather.com. 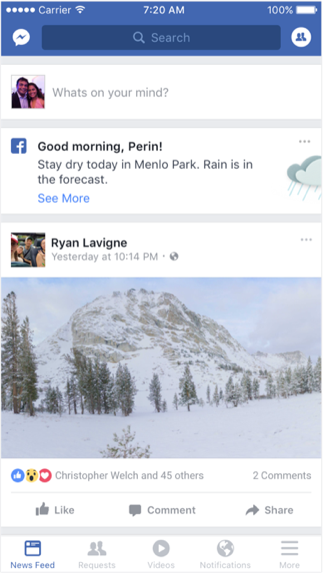 Facebook confirmed that the new feature, an updated version of its earlier “weather greetings,” has launched to around 95 percent of its global population as of this week. This is not the first time Facebook has toyed with introducing weather information into its service. The company years ago added forecasts to events and public places, and more recently was spotted testing weather updates in its News Feed in the U.K.
A year ago, Facebook also rolled out “weather greetings” in News Feed, which were short, informational weather updates that appeared at the top of your feed in the morning. The new feature is an extension on that. You’ll now see similar messages at the top of the News Feed with a link to the full, five-day forecast. These News Feed “greetings” will appear on both desktop and mobile, Facebook tells us. Even if you miss the greeting, you can visit the Weather section in the app, where it exists as a new menu item. In addition, Facebook will now offer an option to set notifications for receiving weather reports. The company says that Notifications and the more detailed greetings are rolling out for tests now, with all these updates being widely available by the end of the month. The Weather section will default to your current location, but you can click the Settings wheel in the top right to add other locations you want to track, just like any other weather app. You also can choose to display the temperatures in either Fahrenheit or Celsius. However, you can’t swipe through your multiple locations once they’re set up, as you could in a typical app like Yahoo Weather or Apple’s Weather app — instead, if you want to change to a different location you have to return to the Settings and tap the one you want to view. The weather information provided is fairly basic — it’s just the highs and lows, along with the general forecast, like sunny, partly cloudy, etc. At the top of the Weather page, you also can see the daily forecast by the hour, as is common in most weather apps today. The information for the forecast comes from Weather.com’s API. The site also is linked at the bottom of the screen where it says “See more weather info,” followed by an icon indicating a new window will open if clicked. The cute, cartoon-style heading at the top of the page also will update based on the forecast. For example, a rainy day in San Francisco right now shows a picture of deer hiding out under a tree. Meanwhile, New York’s currently partly cloudy day shows puffy clouds over green grass, with a bird hiding in the bushes. (See above graphics). This makes the feature feel more personalized, and Facebook-like, as the company has been using similar drawings in its News Feed informational messages for some time. The addition is now one of several new bookmarks Facebook has rolled out to its mobile app in recent days, following useful utilities like its “Wi-Fi finder,” a new networking (or even dating) section called “Discover People” and now Weather. Seemingly, the goal with the new feature is to keep Facebook users in the app by offering them the information they would otherwise need to look for elsewhere, while also offering similar experiences to those that are found in other third-party mobile applications today. Facebook, however, says it’s more about delighting users instead. Thanks to TechCrunch reader Jose Gutierrez for the tip!